Ceps risotto is one of the most classic risotto recipes. Ceps are part of the Italian culinary culture and it is greedily that we find them in this risotto. Very rich in flavor, this risotto with ceps is easy to prepare. 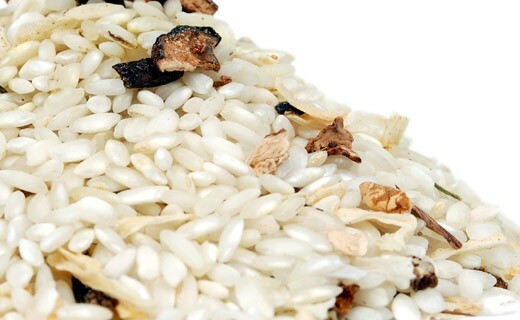 carnaroli rice 90%, dehydrated products: herbal extracts, mushrooms: 3%, onion, garlic, parsley. Production, meanwhile, combines the old method to new processes to deliver what is best. In fact, rice kernels are shelled by hand in the stone to keep all the nutrients. They are then sorted by color, purity and size, retaining only the best beans. Finally, the rice is vacuum packed to ensure optimum preservation. Melt a knob of butter in a pan. Pour contents of the jar into the pan and cook until the rice grains are translucent. Still stirring, add a glass of white wine. When the liquid has been absorbed, pour in gradually as the water is absorbed and a half two glasses of warm water.When all the liquid is absorbed and the risotto with porcini mushrooms has a creamy texture, remove from heat and add a knob of butter and grated Parmesan. Put aside for one minute and add a pinch of salt.